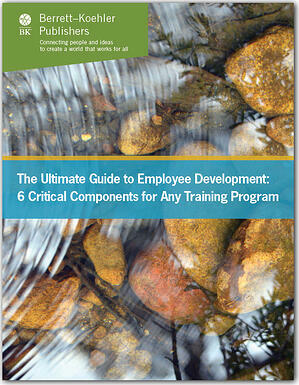 When it comes to training programs, most organizations want to educate, inspire, and motivate their employees. However, many companies fail on all three counts. Maybe they’re focusing on the wrong things and staying silent on critical topics like diversity and inclusion. Or maybe they aren’t offering enough opportunities for growth and development and end up alienating employees who might otherwise have great potential. That’s not what training should be about. That’s why we’ve tapped our expert authors to create this free guide: The Ultimate Guide to Employee Development: 6 Critical Components for Any Training Program. Diversity & inclusion — How to talk about difficult or controversial topics. Time management — How 90 day plans can help measure onboarding success. Personal development — How to help employees establish the right goals. Leadership development — How to incorporate coaching and mentoring programs. Employee engagement & retention — How millennials are changing the way we understand engagement. Organizational development — How to encourage relationship building across department lines. Suggested resources are included for all of these key training topics! Simply fill out the form and download this free resource from BK Publishers. Fill out the form below to access your free download. Why do we accept that Monday morning naturally deserves collective dread? So many organizations are bogged down by outdated ideas based in hierarchy, self-interest, exclusion, and privilege. We at Berrett-Koehler believe this must change. Our mission is about opening up new space for this change to flourish, about bringing people together around the important ideas that that help us see the world in a new way. We offer ideas that redefine what is possible, with books and products that not only inspire us with the vision to give us the WHY, but also equip us with tools to give us the HOW. *We're a B Corp and a California Benefit corporation! We craft our books with you in mind. Our books and products are designed so that busy readers can get the big picture and start building an action plan right away.